A profound sense of the sublime infuses the music of both Johann Sebastian Bach and Estonian composer Arvo Pärt. 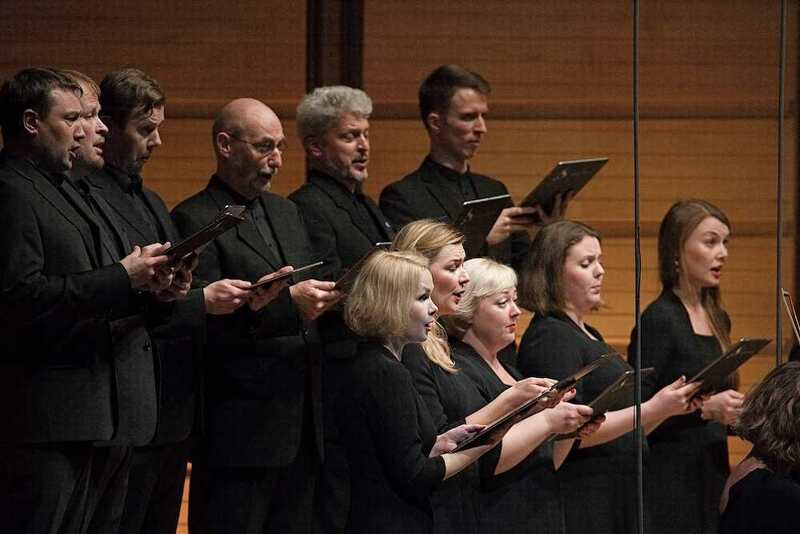 While two centuries divide the composers, the Australian Chamber Orchestra’s elegantly programmed opening tour of 2019 – for which they are joined by the Estonian Philharmonic Chamber Choir – makes a case for their musical and spiritual kinship, the composers’ works interwoven without break over the two halves, conducted by Richard Tognetti. The concert opens in semi-darkness, with the 25-strong Estonian choir arrayed at the front of the stage, unspooling the shifting textures of Pärt’s Da pacem Domine, written in memory of the Madrid train bombings of 2004, the basses primal, almost growling, in the low register and the sopranos luminous. The lights go up on Bach’s Komm, Jesu, Komm, BWV229, and the singers scatter to either side of the stage (splitting into the two antiphonal choirs required for the motet) and revealing the small forces of a reduced ACO, who with the choir conjure the hypnotic stillness of the Pärt into the weaving lines of Bach with organic ease. The choir’s sound is lean and clear, bursting into the bright joy of the repeated “Komm”s against the orchestra’s pizzicati. Aural focus shifts to the strings in Summa, a string orchestra arrangement of what began as a 1977 setting of the Credo from the Latin Mass, written while Pärt was still struggling with the authorities – who had banned professions of faith – in Soviet Estonia, and an early example of what Pärt described as his ‘tintinnabuli’ style (named after the Latin word tintinnabulum, meaning bell). Here the orchestra’s swaying dissonances – rendered by vibrato-less strings – have a quiet, haunting insistence, soon offset by the joyful friction of the choir’s “singet” entries in Bach’s larger scale motet Singet dem Herrn ein neues Lied, BWV225. The affinity between Pärt and Bach is made even more explicit in the opening of the concert’s second half, with Pärt’s 1964 pulsing and shimmering Toccata from Collage on B-A-C-H, the ACO’s muscular strings driving the music forward. Two more Bach motets, the vibrant Lobet den Herrn, alle Heiden and the more reflective Der Geist hilft unser Schwachheit auf give way to the two ‘guest’ composers on the program. Ukrainian-born Estonian composer Galina Grigorjeva’s a cappella In Paradisum is chant-like and ethereal, building to a majestic fullness. The sound of Timo-Veikko Valve’s cello emerged from the silence that followed, with the jagging solo opening of Peter Sculthorpe’s Djilile. Based on an Aboriginal chant from Arnhem Land, the exquisite economy of Djilile – accumulating in string layers across the orchestra – made it of a piece with the rest of the program, and indeed the transition from the Sculthorpe to the elemental drone underpinning the Kyrie of Pärt’s Berliner Messe, the concert’s finale, was a magical moment. While there were one or two moments in this concert, at least at the opening performance, when the choir’s pitch wavered ever so slightly in the sopranos, and there were a couple of uncertain entries in the Mass’s Credo (a major-key reworking of the setting upon which Summe is based), the Estonian Philharmonic Chamber Choir gave a compelling, emotive performance and the Berliner Messe persuasively bound the program’s threads together. The “in gloria Dei Patris” climax of the Gloria is ecstatic while the dark rolling of the Veni Sancte Spiritus is perhaps a highlight of the program. The gentle Agnus Dei offers a final taste of the transcendence common to both Bach and Pärt, a sweet end to a beautiful concert.